Last week on our trip to the states Mark & I visited Gary and the staff at Revolution Church in Canton, Georgia. We listened intently to some of their plans for a great Easter eggstravaganza where they were going to drop 5000 Easter eggs from a helicopter for children to go pick them up. 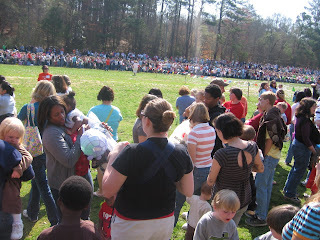 Some of the eggs had prize tickets inside for items like an x-box and iPods. They had been planning for months ant hoped to get 2000 people show up. Seems like around 17,000 descended on the event and it seems like parents the world over react similarly when their is something free on offer for little Johnny. Even though they had what seems like quite allot of problems they still had 17000 people turn up for an event put on by a local church. Read more about the day from one of their volunteers here. We were interested in trying do something similar in our city next year. Maybe Revolution will be able to help us a little more.